I have accepted the challenge to color something every day in June. It doesn't even have to be a full card, just spend 10 minutes or so coloring something. 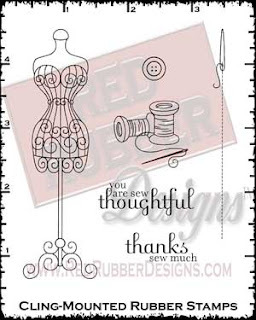 I decided it would be fun to create my own patterned paper with the button in the Sew Thoughtful stamp set by Red Rubber Designs. Once I had my patterned paper I stamped the image and die cut the top layer. I added a horizontal line to ground the dress form then colored a few spots with a violet marker. More and more I am drawn to clean layers so I decided to go with a clean layers style versus a shabby chic or vintage style for this card. The sentiment fits nicely in the center of the top layer with the angled edge. I love your C&S card Angela! Creating patterned paper is what got me started with rubber stamping. Your button design is perfect!